Global markets saw a recovery this month, but underlying sentiment was still weak due to the ongoing trade war worries between China and the U.S. This impacted sentiment in most Asian frontier markets and, as written in last month’s newsletter, valuations for our universe are now at very attractive levels while the trade war spillover will likely not shift the long-term trend of low-cost jobs moving to markets such as Bangladesh and Vietnam. 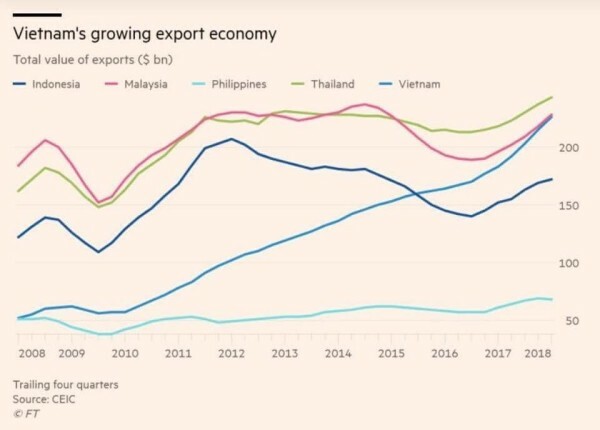 In fact, Vietnam has seen very strong export and foreign direct investment growth so far this year and you can read more on this in last month’s newsletter here. The big event for the month were the National Elections in Pakistan in which the Imran Khan-led Pakistan Tehreek-e-Insaf party won the most seats and is well positioned to form the next government while bringing in much needed political stability. You can read our views on the Pakistani elections here. The AFC Asia Frontier Fund lost −2.2% in July, underperforming the MSCI Frontier Markets Asia Index, which lost −2.0%, and the AFC Frontier Asia Adjusted Index, which lost −0.1%. The fund is now up +48.8% since inception which corresponds to an annualized return of +6.5% p.a. since inception. 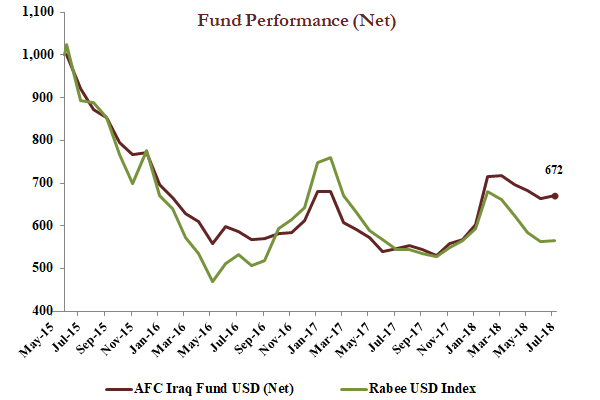 The AFC Iraq Fund gained +1.0% in July, outperforming its benchmark, the Rabee USD index, which gained +0.5%. Year to date, the fund has rallied by +18.4%, outperforming the benchmark index by +18.5%, signalling the long-awaited recovery for the Iraqi equity market after a decline of −68% from the peak in early 2014 until the bottom in May 2016. 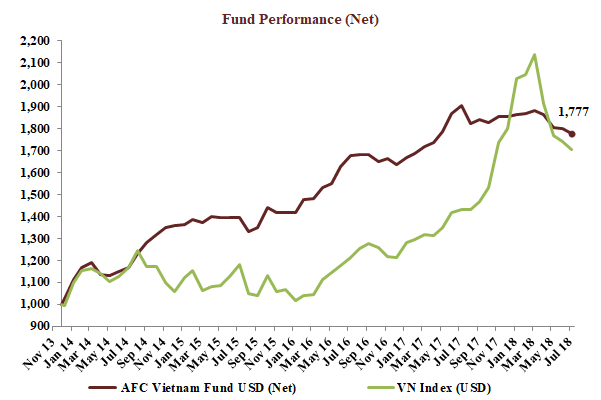 The AFC Vietnam Fund lost −1.3% in July, outperforming the VN-Index in USD terms, which lost −2. 0%. The fund is now up +77.7% since inception, representing an impressive annualized return of +13.3% p.a. 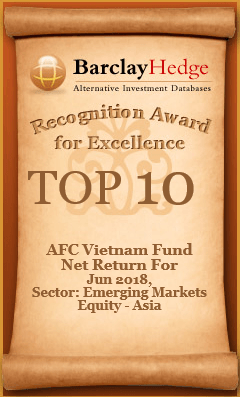 Our AFC Vietnam Fund was awarded the TOP-10 Recognition Award for Excellence by BarclayHedge for its performance during June 2018. While we are not particularly proud of receiving such an award when the fund’s performance during that month was negative, it does go to show that our risk management strategy works, that our losses are kept small, since we are losing less than over 100 other funds in the sector, so that over time the fund can outperform significantly. With the NAV’s of our funds and many of their holdings below their recent highs, now could be an opportune time to get exposure to the promising Asian frontier markets or to add to existing holdings. The AFC Asia Frontier Fund (AAFF) USD A-shares declined −2.2% in July 2018. The fund underperformed the MSCI Frontier Markets Asia Net Total Return USD Index (−2.0%), the MSCI Frontier Markets Net Total Return USD Index (+3.7%), the AFC Frontier Asia Adjusted Index (−0.1%) and the MSCI World Net Total Return USD Index (+3.1%). 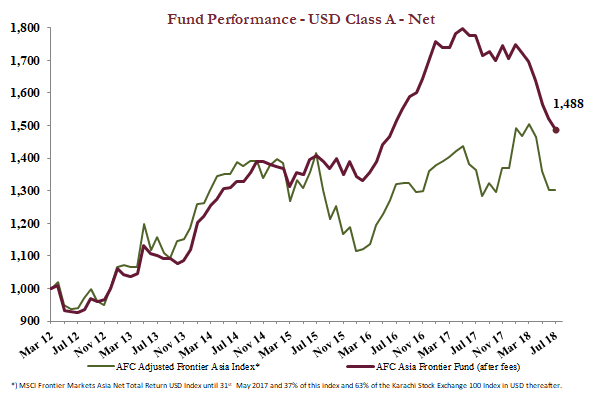 The performance of the AFC Asia Frontier Fund A-shares since inception on 31st March 2012 now stands at +48.8% versus the AFC Frontier Asia Adjusted Index, which is up +30.2% during the same time period. The fund’s annualized performance since inception is +6.5% p.a., while its YTD performance stands at −12.8%. The broad diversification of the fund’s portfolio has resulted in lower risk with an annualised volatility of 9.16%, a Sharpe ratio of 0.66 and a correlation of the fund versus the MSCI World Net Total Return USD Index of 0.33, all based on monthly observations since inception. This month saw a continuation of the trade tensions between China and the U.S. with the latter planning to impose a 10% tariff on a further USD 200 billon of Chinese imports, in addition to the 25% tariff on USD 50 billion of Chinese imports into the U.S. which was announced in June 2018. If implemented, the additional tariffs would cover almost half of China’s exports to the U.S. and these trade worries continued to impact overall market sentiment. As noted in last month’s manager comment, the countries in our universe which are dependent on exports to the U.S. are Bangladesh and Vietnam, but the goods they export are low end or low tech such as garments, textiles, and electronics and are final consumer goods whose imports the U.S. is not putting a lot of pressure on so far. Furthermore, in the case of exports of intermediate goods to China which are then re-processed and re-exported to the U.S., 17% of Vietnam’s exports to China, which is less than 3% of total Vietnamese overall exports are intermediate goods which leaves it in a more comfortable position if Chinese exports to the U.S. do eventually slow down. More importantly, the long-term trend of low cost manufacturing jobs moving from China to Vietnam has been underway for the past few years and we expect this trend to continue in the future. The Vietnamese market remained soft, given that the trade war worries as well as a weaker Renminbi have hurt sentiment, but the macro numbers continue to be healthy. Exports in the first seven months of the year have grown by 15.3% while industrial production was led by manufacturing growth of 13.1%. Retail sales continue to be strong with nominal growth of 11.1% this year and foreign direct investment has grown by 8.8% to reach USD 9.8 billion. However, one of the side effects of the trade war sentiment and a weaker Renminbi was that the Central Bank allowed the Vietnamese Dong to weaken by 1.5% this month. This should not be overly worrisome as Vietnam has foreign exchange reserves of greater than USD 60 billion and a healthy current account surplus. Quarterly results for most of the fund’s holdings in Vietnam have been positive with good growth seen in an airport operator, a cargo handling company, a consumer conglomerate, a commodity goods transporter, and industrial park developers. During the month, the fund invested in an automotive holding company which owns equity stakes in the Vietnamese operations of Honda, Toyota and Ford. Toyota is the leading passenger car player in Vietnam with a market share of 29% while Honda is the leader in the motorbike segment with a market share of 72%. This company offers exposure to the growth of the Vietnamese automobile market, especially that of the passenger car segment, and is trading at an attractive valuation of 6.0x trailing twelve months earnings while offering an attractive dividend yield of 12.2%. Market sentiment in Bangladesh remained soft as the country goes into elections later this year with banking stocks taking the biggest hit so far in 2018 due to worries over their net interest margins as the central bank tries to impose lending rate caps and the state owned banks face non-performing loan issues. However, some of the well-established private banks have declared stable quarterly results. The fund holds the country’s largest bank by market cap whose mobile financial services platform continues to make new inroads with the launch of a smartphone-based application. This app can be used for retail payments and is a way to diversify from the basic withdrawal and deposit services for which the mobile application is predominantly being used for at present. On the monetary policy front, the Central Bank issued its policy statement with no changes to benchmark interest rates and private sector credit growth. The major event for the month in Pakistan were the national elections, held on 25th July, with the Imran Khan-led Pakistan Tehreek-e-Insaf (PTI) party winning the most seats in the National Assembly. The party is now in a comfortable position to gain a simple majority and form the next government with Imran Khan as Prime Minister. This better than expected victory for the PTI is a positive in terms of policy making as it would be the largest party within the coalition government and hence decision making should be more smooth. However, macro concerns such as the declining foreign exchange reserves and the wide current account deficit will take up the most attention in the near term. For more details on the Pakistan election and the outlook going forward you can read our Pakistan Election Note here. In Kazakhstan, the fund’s only holding, the largest bank by assets completed the merger of the second biggest bank by assets into it and this combined entity will have the leading position in terms of market share of loans and deposits while also strengthening the combined entities’ retail banking presence. This merger should enable the bank to benefit from a stable macro environment in Kazakhstan as well as leverage the combined entities’ strengths in the greater Central Asia region. The best performing indexes in the AAFF universe in July were Pakistan (1.9%), Iraq (0.5%) and Vietnam (-0.5%). The poorest performing markets were Cambodia (-4.1%) and Mongolia (-2.1%). The top-performing portfolio stocks this month were: a junior mining company in Mongolia (+29.6%), a Vietnamese commodity transporter (+12.5%), a Myanmar based junior miner (+11.1%), a Bangladeshi commercial vehicle producer (+11.0%) and a Bangladeshi consumer appliance manufacturer (+9.1%). In July, we added to existing positions in Laos, Mongolia, Papua New Guinea, and Vietnam. We added a utility company in Kyrgyzstan (our first investment in this country) and a Vietnamese automobile distributor. We partially sold one Vietnamese company. As of 31st July 2018, the portfolio was invested in 108 companies, 1 fund and held 5.9% in cash. The two biggest stock positions were a pharmaceutical company in Bangladesh (6.9%) and a pump manufacturer from Vietnam (4.4%). The countries with the largest asset allocation include Vietnam (25.9 %), Bangladesh (18.4%), and Mongolia (16.2%). 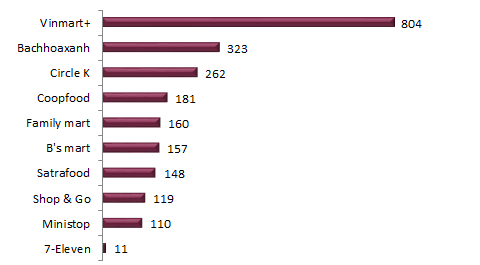 The sectors with the largest allocations of assets are consumer goods (29.1%) and industrials (17.9%). The estimated weighted average trailing portfolio P/E ratio (only companies with profit) was 13.53x, the estimated weighted average P/B ratio was 2.63x, and the estimated portfolio dividend yield was 3.43%. The AFC Iraq Fund Class D shares returned +1.0% in July with a NAV of USD 671.61 which is an out-performance versus its benchmark, the RSISUSD index which was up +0.5%. Year to date the AFC Iraq Fund Class D shares are up +18.4% versus −0.1% for the RSISUSD index. The market, as measured by the RSISUSD index, marked an important bottom in July as part of a likely bottoming process. The multi-month bank selling shifted into high gear. This intensified into a frenzy, climaxing by the middle of the month with the liquidation of a large foreign position in the Bank of Baghdad (BBOB) – one of the top banks on the Iraq Stock Exchange (ISX). 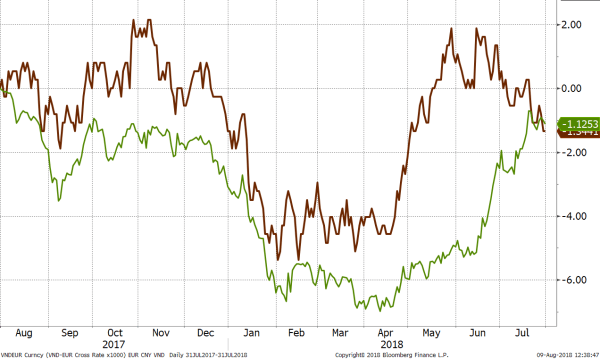 At the worst point in July BBOB and the index were down -24% and -12%, respectively after which both reclaimed these losses to end up +2.4% and +0.5%. The selling in the banking sector over the last few months, driven by concerns over declining FX margins (as explained here in the past), was paced by consistent foreign selling in BBOB. The size of the selling exaggerated the stock’s declines which had a knock-on effect on other banks which declined in-tandem and dragged the market with them given the sector’s dominance of trading on the ISX. Local retail trading is dominated by speculators, yet locals tend to appreciate the true value of local assets, especially at extreme valuations. At the worst point, BBOB’s market capitalization was equal to about 0.3x book value, 8.5% of assets and 15% of cash (based on the trailing twelve months) which would suggest that the stock was discounting some sort of end of the world type event. The locals, aware that such a catastrophe was not around the corner and that the decline was a function of a portfolio liquidation, raised funds from family, friends and banks in order to buy BBOB. Joined by a few foreign investors, undoubtedly aware of the same valuations, the combination absorbed all the significant selling, after which the stock began to climb. 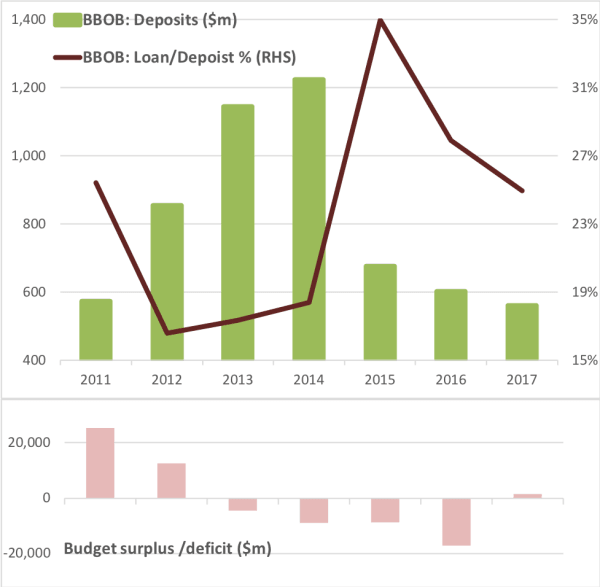 Though NPL’s are relatively high, even during the relative boom times, loans as a percentage of deposits have been very low at the mid-20%’s level, as can be seen below. Moreover, most of these loans are collateralized by property as most banks’ loans are in Iraq where the norm is for collateral value at 2x the loan. 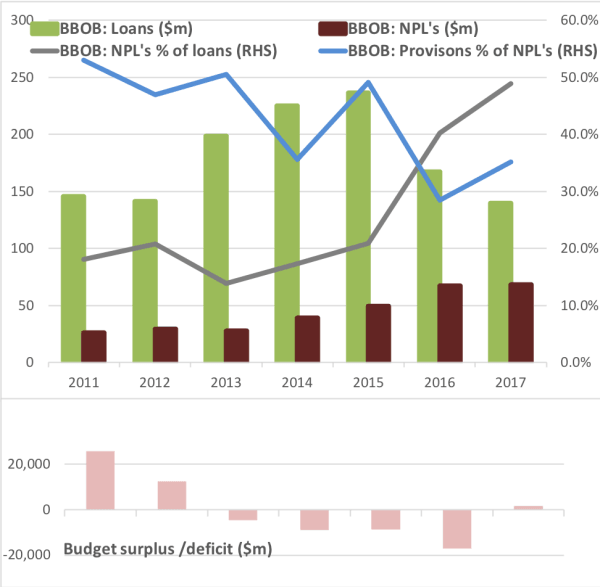 BBOB’s relatively large NPL’s were a function of the relative size of their loan book which meant a larger exposure to riskier loans taken during the boom years. 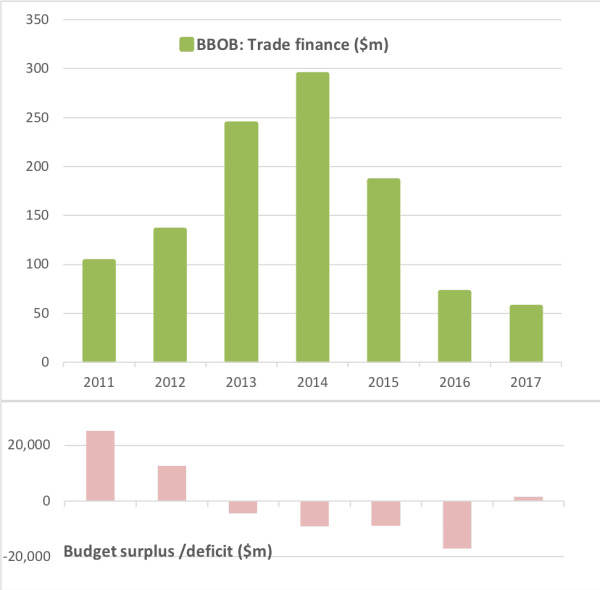 Trade finance, once an engine of growth for the bank, suffered as a result of the sharp economic contraction brought about by investment cuts and the slowdown in consumer spending. It is logical to conclude that the sea change which has taken place in the government’s financial health would reverse the trends that affected the sector’s earnings as the significant stimulus to non-oil GDP should lead to sustainable economic activity which would provide BBOB room to recover, address its weaknesses, and grow. The question - when will these budget surpluses find their way into the economy through government action - has been partly answered by the government’s response to nationwide protests that erupted in early July, demanding the provision of services. The first response was to allocate USD 3bn to the city of Basra to fund long delayed infrastructure projects, a USD 669mn injection into the country’s housing fund to provide about 25,000 housing loans, plus a number of smaller projects in the southern governorates. The eruption of protests in the city of Basra and their spread across the southern governorates right to Baghdad has, as is the usual case in all Iraqi events, led to two polar views. The first dismisses these as the usual ritual of summer protests ignited by the scorching heat that would soon settle with a few government handouts and the end of summer - echoing perhaps an old Iraqi politician who likened Iraqis’ anger to effervescent salts that erupt with a great fanfare before settling down. The second warns of the emergence of instability given that the Iraqi political establishment is incredibly slow to change its bad old habits, if at all, but that the young angry population is running out of patience. It is worth noting that while Iraq has its share of challenges, none are unsolvable in that the key issue of the last few years has been a sequence of crises that have forced successive governments into short-term solutions without providing overall long-term solutions. For instance, the current demonstrations were started by anger over the lack of electricity coverage beyond a few hours each day. Yet, “of 26 gigawatts installed generation, theoretically enough to meet the current 23 GW of demand, less than 17 GW is operable because of lack of fuel, maintenance and transmission capacity: source.” As such, these are addressable in a reasonable timeframe by a focused government with a clear mandate which could emerge given the current pressures from the electorate supported by the religious authority. As of 31st July 2018, the AFC Iraq Fund was invested in 14 names and held 2.5% in cash. The fund invests in both local and foreign listed companies that have the majority of their business activities in Iraq. The markets with the largest asset allocation were Iraq (96.2%), Norway (2.9%), and the UK (0.9%). The sectors with the largest allocation of assets were financials (49.3%) and consumer staples (20.8%). The estimated trailing median portfolio P/E ratio was 13.56x, the estimated trailing weighted average P/B ratio was 0.89x, and the estimated portfolio dividend yield was 7.19%. The AFC Vietnam Fund lost −1.3% in July with a NAV of USD 1,777.44, bringing the return since inception to +77.7%. This represents an annualised return of +13.3% p.a. The Ho Chi Minh City VN Index in USD lost −2.0%, while the Hanoi VH Index lost −1.6% (in USD terms). The broad diversification of the fund’s portfolio resulted in a low annualized volatility of 8.77%, a high Sharpe ratio of 1.45, and a low correlation of the fund versus the MSCI World Index USD of 0.25, all based on monthly observations. Recent market behaviour points to a further stabilization of emerging market stocks after turbulence in recent months. We saw a general recovery from the lows in several markets including Vietnam. As expected, we have also seen declining volatility. While big caps also led this rebound, we have noticed smaller companies with decent Q2 earnings receiving a lot of attention from investors. Periodic uncertainties in all markets, and especially in emerging markets, are healthy and necessary to bring down unrealistic expectations. 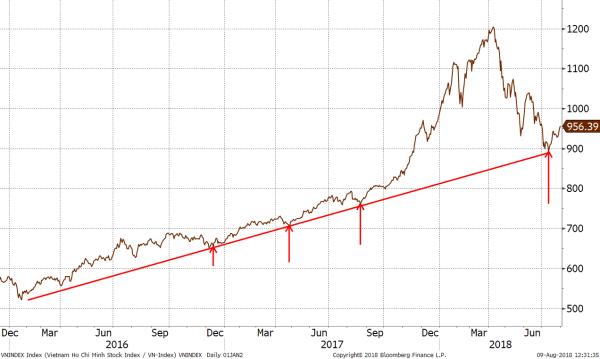 Letting out the proverbial surplus of air from the bull market balloon like in the chart above averts an inevitable larger correction later on, something we have seen during periods of extended speculation over the past 40 years when investing in emerging markets has become fashionable. We are happy to see investors in value stocks continuing to be mostly bullish as we are. In being able to attract new investors, we were not forced to trim down our holdings like many other funds had to do, including ETF’s, but instead we were also able to either enter new investments or increase existing holdings in attractive companies which were pushed down for no fundamental reasons by these forced sellers. After the release of the second quarter results from around 50 (around 70%) of our holdings, we are very happy to see that 29 of them are trading at less than 8x expected earnings for 2018 and 8 of them are trading below 5x expected 2018 earnings. Another stabilizing factor we saw last week was the change in the reference rate for the USD/VND which was raised 1% by the SBV to 23,273 from 23,050. Due to high demand from banks, the SBV sold USD 2bn in six business days through 20th July, curbing the SBV’s foreign reserves to below USD62bn. However, banks were not interested in the SBV’s new asking price and no banks registered to buy from the SBV that day as they could trade at a much lower price of 23,230 in the interbank market. These actions offer more psychological support to the market than a real change in competitiveness against other Asian currencies as they fluctuate much more against the USD than the Vietnamese Dong. How little has changed is shown in the charts of the VND against the currency of another important export market, the European Union, and the VND against the currency of the largest competitor for Vietnam as a production hub, China. Both currencies had swings of 7-10% over the past year just to stay on a more or less level footing. In our view it makes much more sense to use our time to explore and analyse the opportunities in Vietnam than trying to “guesstimate” currency moves which are beyond any reasonable predictability. Additionally, we think that only long-term changes of major magnitudes (20% or more) will shift investments from entrepreneurs and hence change the competitive landscape of countries in a more profound manner. Vietnam, the fastest growing exporting country, in a volatile monetary market. Vietnam became the fastest growing exporting country in South East Asia when exports grew from USD 62.7 billion in 2008 to USD 213.8 billion in 2017, a CAGR of 14.6%. After 10 years, Vietnam overtook Malaysia as the second largest exporter in South East Asia, behind Thailand (USD 236 billion in 2017). In 2018, Vietnam’s export revenues are expected to grow 15% to reach USD 245 billion, on the path to become the largest exporter in the region by 2020. Vietnam’s economic growth was strongly supported by its FDI policies over the last decade to lure more and more investments into the country. With strong fundamentals such as a huge labor force, low wages and improving infrastructure, Vietnam became a destination for many large international companies such as Samsung, LG, Intel and Sony, just to name a few. The strong growth in exports helped Vietnam to enrich its foreign reserves from USD 13 billion in 2010 to USD 62 billion in 2018. Growing foreign reserves and comparably low volatility in the currency continue to attract more FDI investment which are stimulating export growth. Vietnam’s consumption behaviour is changing fast from traditional channels like markets and mom-and-pop shops to modern channels such as convenience and online stores. With a population of around 95 mln, convenience stores became a promising land for investors. However, it is also an aggressive competitive battle between local and foreign investors, the latter of which were sometimes much less successful than originally thought. 7-Eleven, when arriving in Vietnam, announced plans to open 1,000 stores by 2027, which means that it needs to open 100 stores each year. However, after one year of operation, it has opened only 11. Family Mart, a big player from Japan, stated that it would have 1,000 shops by 2020 in Vietnam. However, already in 2017, the retailer changed its Vietnam strategy, citing that it cannot pour more resources into expansion. Sojitz and Ministop are investors in the chain Ministop which had plans for 800 shops by 2018, but so far has only opened 115. A local player The Gioi Di Dong, the largest mobile phone distribution chain, launched Bach Hoa Xanh, a grocery chain which currently has 323 stores. Another retail shop giant is Vinmart +, a member of Vingroup, which has currently 804 stores. There are more than 2,200 convenience stores in Vietnam with more than 1,500 locally owned and 700 foreign owned stores, compared to less than 1,000 two years ago. The fast-growing number of convenience stores pushed rents up sharply in prime locations in HCMC and Hanoi and has created a challenging operating environment. As a consequence, companies have had to close down poor performing locations and moderate expansion growth. The Vietnamese owned convenience stores seem to be more successful due to their cultural understanding in choosing the right location and offering a better product mix for the average consumer. Furthermore, Vietnamese consumers tend to be much more attracted to online shopping than other countries at a similar stage of development. While shopping malls and convenience stores are less visited by Vietnamese and often not as successful so far compared to other countries, the number of online shops is growing at a very fast pace and the entrepreneurship in this segment is amazing. E-commerce is one of the fastest growing sectors in Vietnam and many online shops are actively using social media as their selling platform to satisfy the growing demand from Vietnamese consumers. Consumers are able to order anything from groceries to mobile phones online and some of the shops even guarantee delivery within 2 hours! New business ideas and partnerships are also a result of innovation and the fast-growing consumer base with higher disposable incomes. Most goods on Amazon are not delivered to Vietnam at all and self-importing for private consumers is almost impossible due to complicated and uncompetitive custom procedures. Hence websites like fado.vn were established to order from Amazon websites in Japan, USA and Germany by simply copying the product-link from the Amazon-website into the fado-website. The website immediately gives a competitive quotation in VND, already including custom duties and delivery costs, plus the expected delivery time from the original Amazon distributor. Keeping this unique way of purchasing and delivering goods in Vietnam in mind, regular retail shops will have to adapt their business models to keep up with the competition if they want to survive. Industrial production grew at an impressive rate of 10.9% in July and FDI disbursement increased by 8.8% to USD 9.9 billion. Exports grew by 15.3% year on year to USD 133.7 billion, which generated a trade surplus of USD 3.06 billion in the first 7 months of the year. At the end of July 2018, the fund’s largest positions were: Agriculture Bank Insurance JSC (3.8%) – an insurance company, Sametel Corporation (3.5%) – a manufacturer of electrical and telecom equipment, Vietnam Container Shipping JSC (2.8%) – a container port management company, Global Electrical Technology Corporation (2.2%) – an electrical equipment company, and Cantho Pesticides JSC (2.2%) – a manufacturer of agricultural chemicals. The portfolio was invested in 71 names and held 4.7% in cash. The sectors with the largest allocation of assets were industrials (32.6%) and consumer goods (31.5%). The fund’s estimated weighted average trailing P/E ratio was 9.62x, the estimated weighted average P/B ratio was 1.53x and the estimated portfolio dividend yield was 7.15%. In lieu of our usual travel report, this month we are discussing a portfolio company of the AFC Asia Frontier Fund to showcase some of the deep value and growth which exists in our frontier universe after the recent sell-off in Asian emerging and frontier markets. The World’s Cheapest Energy Producer? In a world of overvalued stocks, sometimes you have to go off the beaten path. What if I could tell you that you could buy a company at 0.85 times next 12 months after-tax cash flow that will likely grow profits in the next few years and has several potential lottery tickets that could lead to 19x upside? Of course, you’d be interested, that’s darn cheap! What if it was a Mongolian coking coal mine? Well, at least you know why it’s cheap. More importantly, recent data shows that the business is markedly recovering from export issues over the past 3 quarters—yet this is not reflected in the share price. Coking coal is used in the production of steel and the price fluctuates with global demand. China has increasingly been closing smaller mines and consolidating mid-sized operations as part of its green initiative, while global demand has increased—leading to a coal price that is profitable to produce, yet not so high that there has been an overwhelming increase in production. Therefore, it is expected that seaborne coal prices will remain stable at between USD 150 and USD 200 a ton and washed coking coal on the Mongolian-Chinese border will continue to sell for a long-term average price of USD 115 per ton (roughly where it has been for the past 2 years). Mongolian Mining Corporation (MMC) (traded on the Hong Kong Stock Exchange: 0975, on the US Pink Sheets: MOGLQ, and in Frankfurt: 29X.F) is the second largest coal producer in Mongolia (and has a JORC-compliant resource of 1bn in coal reserves between its two mines: Ukhaa Khudag and Baruun Naran) after state owned Erdenes Tavan Tolgoi (ETT). They both produce from the Tavan Tolgoi basin which is 270 km from the Chinese border. However, MMC is the only producer of washed coking coal in the region, whose plant has a name-plate capacity of 7.5 mln tons of coal per year, while ETT sells unwashed coal for a paltry USD 77/ton. MMC’s all in cost to deliver washed coal to the Chinese border is roughly USD 55 per ton, which includes roughly USD 15 in truck transport costs. This means that MMC earns a net-back of USD 60 per ton (USD 115 – USD 55). Trucking costs were elevated at USD 20 per ton during 2H 2017 due to border issues and have since normalized back to USD 15. The company owns two mines, Ukhaa Khudag and Baruun Naran with a combined resource of just under 1 billion tons of coal. It should be obvious that trucking mln of tons of coal to the Chinese border is ludicrous for many reasons as it leads to an increase in costs and bottlenecks at the border to pass through customs. This trucking issue has become a severe bottleneck for all Mongolian producers. In addition, it creates severe environmental damage on both sides of the border and leads to chaos at the Chinese side of the border where coal is unloaded from trucks onto train-cars. Clearly, there should be a railroad to increase export volumes and lower costs. China has already been mandating the end of trucking coal in Chinese provinces in order to reduce coal dust pollution and increase efficiencies. However, a combination of a weak government and competing interests has stalled the ability to build a railroad on the Mongolian side of the border. After years of delay and inaction, the Chinese decided to force the issue, and China reduced import volumes from approximately 1,500 trucks a day to under 400 a day starting in the summer of 2017. This severely impacted MMC’s quarterly coal exports (see chart below) which had been ramping up after a restructuring (more later), which then impacted profitability during the 2nd half of 2017 and Q1 2018. In March of 2018, Mongolian Prime Minister U. Khurelsukh held several high-level meetings in China, where it was agreed that Mongolia will open up tender opportunities for Chinese firms to build the railroad, while Mongolia would own 51% of it. Following these meetings, the Chinese have relaxed the border and subsequent border volumes are returning to prior levels (presumably on the understanding that the Mongolian government will choose a Chinese firm to build and operate the railroad). This compares quite favorably against a current market cap of USD 194 mln (at 0.148 HKD per share, at the time of writing). At a multiple of 5x USD 226 mln in after-tax income you would have a market cap of USD 1.13 billion or 5.8 times today’s price. If exports can expand to the full 7.5 mln-ton name-plate capacity of the wash plant, then after-tax income increases to USD 293 mln. At a multiple of 5x after-tax income you would have a market cap of USD 1.47 billion, or 7.6 times today’s price. There is also lottery ticket upside potential related to the new railroad. If the railroad is built, transport costs decline by USD 10 a ton as it is far cheaper than trucking the coal. At 6 mln tons, after-tax income would expand to USD 271 mln . Additionally, the railroad is anticipated to have the capacity to move 30 mln tons per year, leading to a dramatic increase in export volumes. If MMC could expand production see 15 mln tons in sales, at a USD 45 per ton cost after tax-income would be USD 743 mln. At a 5x multiple, the company would be worth USD 3.7 billion, or 19 times more than today’s value. At today’s share price you don’t need everything to go right, you just need nothing to go too badly wrong. No report would be complete without discussing the economy of Mongolia. After growing 17% in 2011 the economy collapsed following the 2012 election of the nationalistic Democratic Party of Mongolia (DP) which focused on doing everything they could to derail the economy by targeting both foreign and local businesses, leading to economic chaos. The DP was soundly trounced in the 2016 elections where the Mongolian People’s Party (MPP), historically the pro-growth and pro-business party, won 65 out of 76 seats in Parliament. 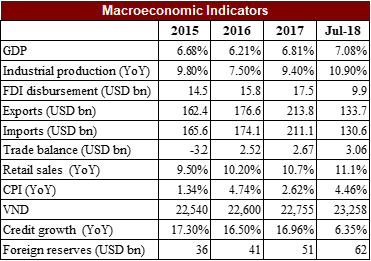 Since then, the political climate has been stable and economic growth has returned to Mongolia with Fitch recently upgrading the country to “B,” and foreign reserves have recovered to USD 3.2 billion, the highest since 2013. The next parliamentary election is in 2020 and it is expected that the MPP will retain control of parliament, though they will likely lose a number of seats. This gives a 6-year window of stability to future investments in Mongolia. Additionally, MMC is controlled by MCS Holdings which is the holding company of one of the most powerful MPP-affiliated families in the country. Looking at the balance sheet; MMC had an IPO in 2012 and grew out its infrastructure and resource base as commodity prices peaked, with coking coal prices subsequently falling from >USD 200/ton to USD 70/ton. This drove the company which had USD 750 mln in debt into provisional liquidation. With PricewaterhouseCoopers appointed as the Joint Provisional Liquidator they rather quickly and correctly came to the assessment that it would be near impossible to seize fixed assets of the most powerful conglomerate in Mongolia. Thus, a path towards restructuring ensued and in June 2017 MMC formally exited provisional liquidation with its USD 750 mln in debt cut to USD 638.7 mln in new bonds paying interest in PIK and equity dilution of 10%. The result is a lean company which focused much of 2015 and 2016 removing overburden (making their financials downright ugly and ripe for negotiating a favorable restructuring), which has positioned the company for an eventual move towards full production, last experienced 5 years ago. Currently, despite USD 638.7 mln in debt, the effective debt is much lower due to the fact that USD 195 mln is in the form of perpetual notes that do not pay or accrue interest until the senior debt is fully paid off. In reality, actual senior debt is only USD 443.7 mln. Furthermore, the senior debt has a toggle feature that pays interest based on benchmark coal prices—hence they are insulated from any decline in coal prices in the future. Based upon the indenture, these notes must be paid off through a cash sweep—meaning that as coal volumes recover cash will be applied to retire debt and de-lever the company, which lowers interest expense and overall enterprise value. Based on current production rates, MMC is likely to be debt free in roughly 2 years—making it one of the least risky coal companies in the world. In summary, MMC investors need to stomach a bit of Mongolia risk, but Mongolia risk has dissipated as of late—yet due to weak export volumes over the last 3 quarters, there is upside potential of 5.8 to 19 times. Meanwhile, coal prices are likely to remain roughly stable and MMC remains a low-cost coking coal producer, when compared to seaborne coal suppliers (Australia, USA, Canada) should coal prices decline. Disclosure: the AFC Asia Frontier Fund holds shares in Mongolian Mining Corporation (975 HK). AFC Asia Frontier Fund is registered for sale to qualified /professional investors in Japan, Singapore, Switzerland, the United Kingdom, and the United States. AFC Asia Frontier Fund (LUX) is registered for sale in Luxembourg. AFC Iraq Fund in Singapore, Switzerland, the United Kingdom, and the United States. AFC Vietnam Fund in Japan, Singapore, Switzerland, and the United Kingdom.